I had a moment of clarity a few days before seeing it that I was anticipating going to a movie called Ant-Man and the Wasp. Twenty years ago that would’ve been the title of a 50s B-movie being riffed on Mystery Science Theatre 3000. It says a lot about the dedication, power, and impact of Marvel that the twentieth film of their Cinematic Universe is the sequel to the movie about the shrinking superhero. It’s gotten to the point where they can make a concept work, regardless of how cheesy it sounds, not once, but twice. Scott Lang (Paul Rudd) has been under house arrest ever since joining Captain America’s team in Civil War, an action that has also made his former friends Hank Pym (Michael Douglas) and Hope van Dyne (Evangeline Lilly) fugitives. They reach out to him though when it becomes apparent he holds the key to rescuing Pym’s wife Janet (Michelle Pfeiffer) from the subatomic quantum realm. As a tortured stealth agent (Hannah John-Kamen) tries to steal Pym’s technology, Lang and van Dyne team up as Ant-Man and the Wasp to subdue her and protect the security of their mission. Director Peyton Reed really knows how to work with Marvel’s distinct operating system of crossover and intertextuality. Rather than seeing the use of Ant-Man in Civil War as something to work around, he and the screenwriters use it as a jumping off point, essentially providing the catalyst for where a lot of the characters and their relationships are in this movie. This allows the film to feel both organic within the universe and self-sustaining enough to be divorced from the greater action elsewhere in that universe -though to less of a degree than Ant-Man. The plot itself, which involves a number of parties trying to acquire a portable building housing most of Pym’s technology, isn’t very interesting; and either of the two subplots concerned with a black market gang led by a hammy Walton Goggins and the FBI searching for the trio, could have easily been dropped. But if not justified, they’re atoned for by the charm of the performances and the inventiveness of the visual effects. 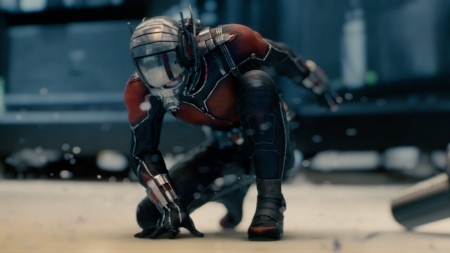 Despite the equal billing of the two lead characters, Ant-Man is still the protagonist more than The Wasp. He has more screen-time, more of a character arc, and the film just seems more drawn to Paul Rudd’s charisma and sense of humour. But Evangeline Lilly certainly isn’t lacking for presence or performance. Her character is expanded on, her capabilities and intelligence is shown off a number of times, and she’s the more engaging superhero in the action sequences. The two also have serviceable chemistry, but they need Douglas’ grumpy genius to really complete the team. He too is more active in this film, and has a lot more emotional weight tied into their endeavour, though I do wish the movie had explored more the responsibility he had in the creation of this movies’ villain. That villain however had the greatest character arc. Though not quite as compelling and certainly not as threatening as either of her immediate Marvel predecessors, Hannah John-Kamen’s Ghost is an incredibly refreshing kind of antagonist: genuinely sympathetic, desperate, and a victim in a way we haven’t seen from a Marvel movie in a while. And how she’s ultimately dealt with is equally different and gratifying. Laurence Fishburne is great, as is Michelle Pfeiffer for her limited appearance. And Randall Park, despite having to work through some awkwardly oriented exposition early on, is pretty funny as Lang’s FBI watcher. Additionally, Michael Pena, Tip “T.I.” Harris, and David Dastmalchian reprise their roles as Lang’s friends; as do Judy Greer and Bobby Cannavale as his ex-wife and her husband, and Abby Ryder-Fortson as his daughter Cassie. Just like the first movie, Ant-Man and the Wasp somehow is able to consistently surprise with how much it gets out of the gimmick of size-shifting for the purposes of action or comedy. It still comes up with clever and creative ways to experiment, also utilizing the “giant man” revealed in Civil War to fun lengths. While there’s plenty of good humour in the script (credited to five writers including Rudd and Chris McKenna), the physical comedy that takes advantage of the effects is the more memorable stuff, such as the extendible handle on a shrunken office building and one hilarious sequence in an elementary school. But the visuals are also ambitious when it comes to travelling to the quantum realm, a subatomic world beyond microorganisms and identifiable matter, and Ghost’s “quantum phasing” ability, which she describes as the result of her cells constantly separating and re-assembling. They’re impressive, imaginative visuals that more than make up for a few still not quite convincing de-aging effects. Compensating naturally weaker elements with humour, great visuals, and even a good message relating to how it approaches its antagonist, Ant-Man and the Wasp maintains the charm and affability of the first movie, while including some new elements that make it entertaining and fulfilling. It doesn’t mark any major changes in the greater MCU, but that’s really preferable coming off such a grand and devastating behemoth asInfinity War. After which, it’s by no means an “important” Marvel movie, but it is a necessary one.